Pressure Cooker Sauerbraten is an easy and delicious recipe with a wonderful sweet and sour gravy that cooks in minutes instead of hours. 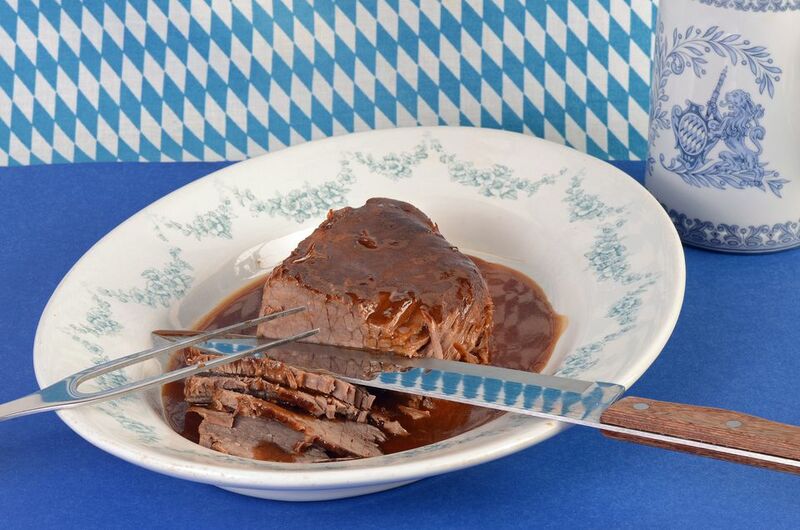 This delicious quick pressure cooker recipe tastes just like authentic Sauerbraten, which traditionally takes days of marinating the chuck roast and hours to cook. Trim excess fat from roast and pat dry with paper towel. Rub with salt and pepper to taste. Place oil in pressure cooker and brown the roast on all sides using the brown function or using an old-fashioned cooker without the lid. In ​a small bowl, combine water, vinegar, wine, sugar, cloves, salt, and bay leaves. When roast is browned, place the chopped vegetables and gingersnaps around the meat and pour the vinegar mixture over all. Cover cooker, raise ​the pressure to high and cook for 50 minutes. Release pressure using natural pressure release (just let the pressure cooker cool down), about 30 minutes. When the pressure drops, remove the cover, remove the meat to a platter and cover with foil. Remove bay leaves. Pour sauce and cooked vegetables into a blender or food processor and process until smooth. Serve with the sliced beef.